1) Hide your grey hairs with mascara, layer your hair mascara well to conceal them completely. 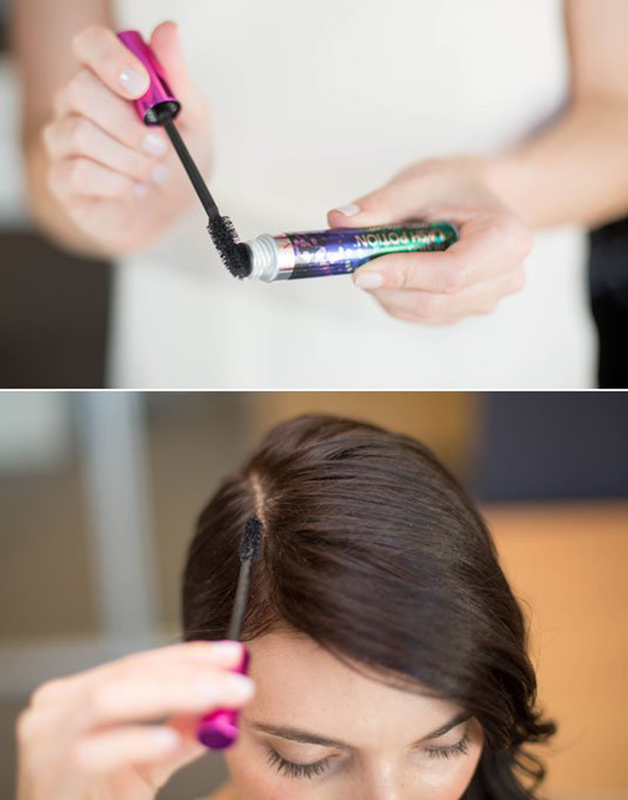 2) Brush in some eye shadow to make your hair appear thick and dense. 3) Make your ponytail appear longer by making one pony on the top and other one on the lower head. 4) Reduce dryness and frizzes from your hair bring your hair upside down and then blow dry them. 5) Make your own summer beach look spray by mixing water and salt. Mix the 2 ingredients well and spray over your hair to create beach waves I n your hair. 6) This is how you can make beach waves with flat iron. 7) Create beach waves naturally by braiding them. Once the hair is braided run a flat iron over it and opens the braid, your hair will natural waves in therm. 8) Tie your hair in a ponytail and split it in two parts. Roll each part of your hair in curling iron one by one and once done open the ponytail. 9) Disguise your long hair as bob cut hair with this hair trick.